Lately I’ve been doing a lot of travelling around the country. More often than not, that has necessitated very early starts to catch the “red eye” flight out of town. As described previously, my usual method of getting to the airport at that time of the morning is to bike to the Bus Interchange and then catch the first airport bus of the day. Then at the end of the day, the process is reversed to come home. 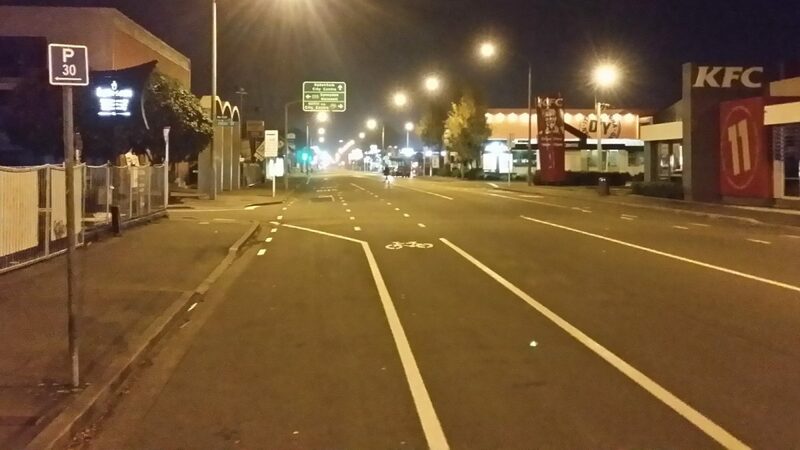 One thing that you become aware of is how nice it is to ride your bike in the quiet hours of the night. Assuming that you are well lit up and (if need be) warmly wrapped up from any chill, you get to take advantage of the greatest benefit of night-time cycling – little traffic. Often you can ride miles without seeing anyone driving around, having the whole street to yourself. It’s interesting to see who is around in the wee small hours. Street cleaner trucks do their thing, delivery trucks bring their wares (and often park in the cycle lane while doing it…). The gym is full of loud music and keen bodies working out (or they could have just gone for a bike ride…). And there is usually a surprising number of other people out biking already in the early morning, often heading off to start an early shift. 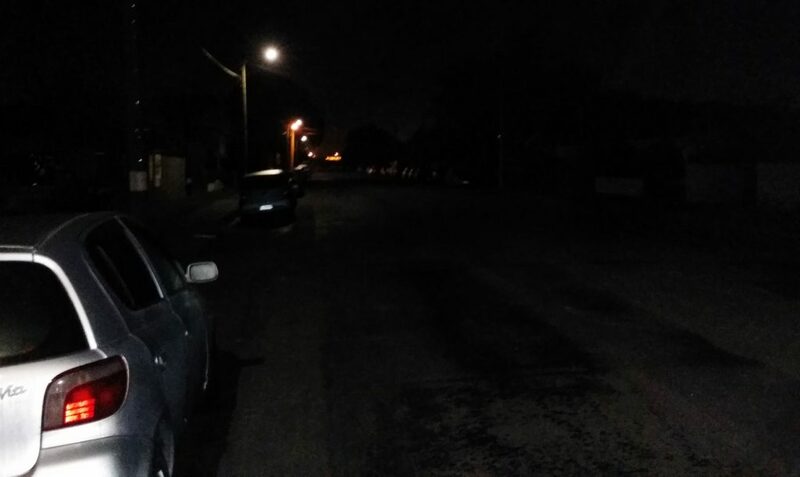 Riding in the dark – is it a bit scary? Now I appreciate that for some people, the prospect of biking at night seems a bit scary, especially when we hear stories of attacks at night. Notwithstanding that the reality is much better than the perception anyway, I would argue that biking is probably safer than walking at night; it’s harder for someone to accost you and a lot easier to get away (you could even learn how to use your bike as a weapon…). But if you’re concerned, stick to more public and well lit areas, e.g. main roads instead of secluded pathways (as I say, there won’t be as much traffic as usual on those main roads overnight). Do you enjoy biking at night? I love cycling at night, it so much quieter and the darkness seems to help with boosting your senses. Like smell, you notice the flowers scent and trees more. I am in London, UK. Your sentence about not coming across many people made me smile as years ago, I was driving in some parts of New Zealand and we could drive for quite sometimes before seeing another car. Sometimes none at all, just sharing the way with a train! Thanks for this blog! As a young woman who’s been biking daily for transport for over ten years, I absolutely agree that biking at night is safer than walking at night. I’ve had one single minor incident during these ten years, where a guy kind of lurched towards me from the footpath (still meters away though), waved his arms out and said something to the effect of “Bleurgh”. Just a stupid guy trying to give me a fright. There are many places I feel comfortable riding at night that I would definitely not walk through, like Hagley Park. And yes, the wide, traffic free streets are wonderful . It was my solace of sometimes working late back in Wellington, when finishing work at 9pm would see me sailing down the tree-lined lanes of Lambton Quay, no cars in sight – what a lovely way to end a day! Biking in the dark is just magic! Whether it’s for commuting or sport. Especially a MTB ride gives you more confidence as you cannot see all the potential obstacles and suddenly you just get over them without any issues. Try to do it in daylight and you see what you actually achieved! Great mental boost. Road riding with your buddies creates a special connection as you need to be well lit up and look out for each other more than necessary. But still the best is riding in the dark with your children. They hear noises and see things (nothing nasty) that they never would in the back of the car. Don’t forget to give them colourful spoke lights. Everybody loves those! The traffic lights often go onto sensor control rather than a timed schedule. So pick the right road and you could have the mythical Green Wave all the way. Once warmed up, petrol engines feel extra peppy on a frosty cold morning, due to the increased oxygen density of the air. I’m positive there is a similar advantage to the rider too, once you hit the a steady state of cooling from airflow and muscle’s heat output. As long as its not cold enough to impact your breathing. Lennyboy – why don’t you ride to the airport? Or do you leave your bike at the bus station? 15+ km to ride from my place to the airport; not what I want to do before hopping on a plane (or at the end of a long day). So I park up at the bus interchange after a much shorter ride. Just like driving, sometimes it’s better to drive at night than in daylight because of the calmness it gives and despite the danger that might happen. Just be sure that you have your long-lasting lights and reflective with you and stay vigilant. Thanks a lot for this blog!